For nearly fifty years, three generations of the Zivic family have worked hard to establish ZM Sheet Metal’s excellent reputation for making ductwork for customers in the mid-Atlantic region and up into New England. The corporate offices and a small plant are located in Chantilly VA with the main manufacturing facility an hour’s drive away in Winchester VA.
ZM Sheet Metal produces ductwork to support the HVAC systems in both commercial and residential buildings. The detailed, illustrated online catalog shows all the standard parts that can be ordered from distributors. The experienced team at ZM Sheet Metal is also prepared to customize parts to meet customer specifications. The volume of repeat business speaks to both the quality of the product and the prompt order fulfillment. 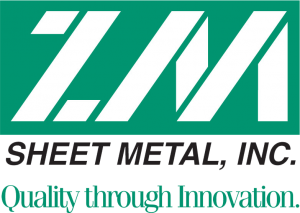 In early 2013, a new generation of management at ZM Sheet Metal decided to update the way they managed the inventory. The traditional pen and paper system had worked well but it was time to digitalize the procedures to take advantage of inventory technology. At that point, management did not even have an accurate count of their current on hand inventory. They wanted a location-based inventory tracking system that covered both warehouse locations. They also wanted to make better use of barcode information to increase the accuracy of shipping and receiving product. It was also important that the software would be supported by handheld mobile data terminals to increase productivity in the warehouse. After a thorough review of the ZM Sheet Metal operations, the IntelliTrack team recommended the installation of their Warehouse Management Software (WMS) RF Professional inventory software with modifications and integration with QuickBooks for purchase orders for raw materials, sales orders and invoicing. It was up to ZM Sheet Metal management to decide what WMS functions they required. In order to meet their current requirements, the ZM Sheet Metal team decided they did not need to identify Units of Measure, lots, expiration dates, serial numbers and pallet tracking. However, they know those functions are still available through WMS RF Professional for use in the future. IntelliTrack usually schedules an 18 week timeline from the initial meeting for outlining the scope of the project through development and installation to training and testing. ZM Sheet Metal went live in April 2014 with only minor glitches to be resolved. ZM Sheet Metal has been pleased with the way IntelliTrack has been able to accommodate their unique needs. Since the initial installation, IntelliTrack has introduced another 20 modifications or customer reports to further enhance the company‘s capacity for effective inventory management. All these positive outcomes have resulted in greater customer satisfaction and sustainable profitability for ZM SHeet Metal. ZM Sheet Metal continues to be pleased with IntelliTrack WMS RF Professional software and the ongoing support and service.